This article draws from primary sources at the Eisenhower Presidential Library, the Department of Defense Film Liaison Branch archive at Georgetown University Special Collections, the Stanley Kramer deposit at UCLA Arts Special Collections and the declassified files at George Washington University’s online National Security Archive. 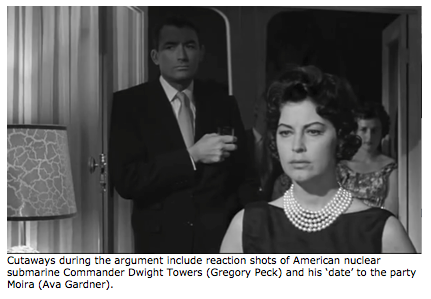 It is less concerned with the dramatic, aesthetic, narrative and textual readings of Stanley Kramer’s film On the Beach (USA 1959) than with considering its geopolitical, cultural and scientific contexts. While many studies have been produced concerning the convergence of politics, history and the influence of government agencies in producing soft power during the ‘American century’, little has been done to uncover direct influence by US Administrations on impacting individual films. The U.S. government’s recalcitrance over releasing information directly to the public about the twenty-first century’s most important intelligence search and military raid, and its decision instead to grant the film’s producers exclusive and unprecedented access to classified information about the operation, means that for the time being – for bad or good – Hollywood has become the public’s ‘account of record’ for Operation Neptune Spear […] In this extraordinary case, a Hollywood motion picture, with apparent White House, CIA, and Pentagon blessing and despite its historical inaccuracies, is now the closest thing to the official story behind the pursuit of bin Laden. But this is merely business as usual. Military and film historians such as Laurence Suid (1996, 2002) have long demonstrated the relationship between the US Department of Defense (DoD) in forging ‘official cooperation’ with Hollywood studios, where strict guidelines of rendering military assistance to any production were evaluated on whether the project benefitted the Pentagon’s perception of maintaining the reputation of the armed services and acting in the national interest. Based on Nevil Shute’s best-selling novel, Stanley Kramer’s film adaptation of On the Beach drew the attention of the Eisenhower administration in ways that the published book – which was also widely serialised in international newspapers – mostly avoided. Upon securing the rights to the novel Kramer enlisted retired Vice-Admiral Charles A. Lockwood to act as technical advisor and, later, as go-between in discussions with the Pentagon and his independent production company concerning official cooperation to access a nuclear submarine for on location filming. However, in the pre-production planning Kramer was effectively given the runaround, and ultimately an official refusal to cooperate, by various senior Naval liaison officers. Undeterred, and emboldened by his earlier successful stoush with the Navy during The Caine Mutiny (USA 1954), Kramer pitched his project to Navy heads in Washington. Begrudgingly, and only after the intervention and direction of Navy Chief of Operations, Admiral Arleigh Burke, official cooperation and a nuclear submarine was offered, though it was too little and too late. Kramer had by then completed principal photography by enlisting the aid of the Australian Navy, converting the façade of a conventional submarine (HMAS Andrew) to mimic the new nuclear craft’s conning tower. The primary concern of the Navy and the motion picture liaison branch at the Pentagon was the film’s philosophical position in relation to nuclear weapons and US deterrence policy. Kramer’s protracted negotiations over military cooperation occurred during a period of intense international debates and public protest concerning the global effects of fallout, especially the biological uptake of radionuclides from ongoing atmospheric testing (USA, USSR, UK). Increasingly the tripartite ‘nuclear club’ faced calls to halt or limit their continuing experimentation, while other nations proceeded to proliferate nuclear technologies for their own imminent deterrent capacity (France, China, Israel, India). In the novel Shute presents rampant proliferation as the principle cause of the initial nuclear war and its rapid escalation amongst the superpowers. 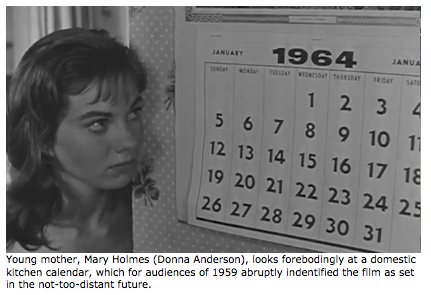 These literary and geopolitical prophecies failed to resonate in Stanley Kramer’s final shooting script or released film. Yet it was the movie’s very ambiguity of narrative cause-and-effect that led to the highly contested nature of official military cooperation and later the Eisenhower White House campaign to undermine the film’s credibility. Having effectively bypassed the Pentagon, Kramer sought to maximise the film’s impact globally by releasing it simultaneously, premiering in multiple world capitals, including some behind ‘the iron curtain’. The producer-director arranged a series of public discussions with leading experts, philosophers and theologians to debate the film and the political-military context, while sotto voce initiating a campaign to secure nomination of the film for that year’s Nobel Peace Prize. Officially, the film was condescendingly greeted as ‘science fiction’, a fantastic drama depicting near-future events that had little basis in the military and scientific reality of late 1950s. Within US policy circles and administrative agencies the production and distribution of On the Beach faced, at best, institutional indifference or ambivalence, and at worst a concerted strategy by multiple levels of US government to undermine and minimise the impact of the movie’s domestic and international reception. This concerted negative campaign should not be underestimated since it involved coordination at the highest levels, including discussion at US Cabinet level led by Vice President Richard Nixon, the Secretary of State, the Secretary of Defence, the Atomic Energy Commissioner and both heads of the US Information Agency and Office of Civil Defence Management. Nevil Shute’s narrative conceit in On the Beach, echoed in the screenplays by Bill Paxton and Jame Lee Barrett and Stanley Kramer’s film realisation, was that a fictional pall of long-lived dirty Cobalt radiation crossed the hemispheres as fallout over many months, killing all in its path. Set in a not-too-distant future, four years ahead, unchecked nuclear proliferation had led to even minor states acquiring atomic weapons, with the major powers ‘salting’ their devices with cobalt to produce a long-lived radioactive isotope in order to decimate their enemies and leave the attacked territories uninhabitable for years. The concept of Cobalt bombs went back to 1950 when Leo Szilard and James Arnold created significant debate before the successful testing and deployment of hydrogen bombs. These early deliberations and subsequent media reportage speculation also inspired Nevil Shute, and RAND Corporation nuclear strategist Herman Kahn. The seemingly abstruse scientific concept of Cobalt bombs was frequently reflected in popular culture throughout the era, from comics and movies through to children’s television serials, including episodes of Rod Brown of the Rocket Rangers (1954) and Sea Hunt (1960). The spectre of Cobalt bombs created sensation and mild panic in the Australian press in mid-1953 during the secret lead-up to the first continental A-bomb tests by the UK on mainland Australia. Before the Maralinga test site was established and the initial devices exploded in central Australia at Emu Junction, the press speculated on British reports that the first bomb would be a cobalt device. Neither confirming nor denying the reports, Prime Minister Menzies and Minister for Supply Beale, assured the public that the test would be safe. While the Melbourne Sun news pictorial headlined with “No cobalt-bomb to be exploded in Woomera test”, it went on to quote Albert Einstein, and local physicists Mark Oliphant and Harry Messel. Cobalt bombs, these experts warned, were “sufficient to extinguish life from the world”, “capable of wiping human life from the globe” and “the most dangerous and lasting explosive ever invented”. An adjacent report followed with the headline: “Push-button nightmare”, luridly describing how one man with the resources of cobalt weapons at his disposal could push a button with “every likelihood that life would perish from the world”. Given the extensive national and UK media reportage, it would be difficult to believe that WWII secret weapons engineer and author Nevil Shute, who had immigrated to Australia, was oblivious of these speculations. 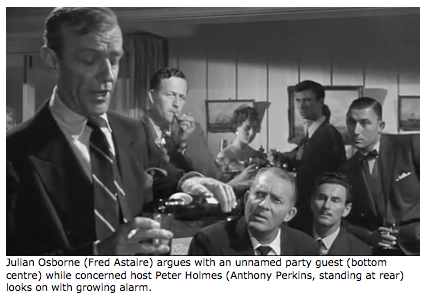 The film chiefly employs the rhetoric of Julian Osborne (Fred Astaire), an elderly alcoholic physicist, to provide expository dialogue that first interprets the ‘how and why’ that the characters face irrevocable global extinction. In an early sequence set at a suburban Melbourne party, ostensibly to welcome the captain of the last visiting (nuclear) submarine, the physicist is introduced mid-sentence, in a testy and alcohol-fuelled exchange with an unidentified guest. Man: …that’s sheer balderdash. I’ve never heard so much nonsense in all my life. You mean to tell me that this whole damn war was an accident. Julian (obviously drunk): No, it wasn’t an accident. I didn’t say that. It was carefully planned, down to the tiniest mechanical and emotional detail. But it was a mistake… It was a beaut. In the end, somehow granted the time for examination, we shall find that our so-called glorious civilization was destroyed by a handful of vacuum tubes and transistors. Probably faulty. Man: Ah, there you are Julian, there you are. Now we know where the blame lies, don’t we. Julian: Aw, no you don’t. No, no. No, maybe, maybe we were the, the blind mechanics of disaster. But you don’t pin the guilt on to the scientist that easily. You may as well pin it on … ‘motherhood’. Man: Well, it should be pinned on somebody. And you scientists are the likely ones as far as I can see. You built the bomb. You experimented with it, tested it and exploded it. Man: Thanks to you chaps, a moment is just about all we have. Julian: Every man who worked on this thing told you what would happen. The scientists signed petition after petition. [host Peter vainly intervenes to stop Julian’s rant] But nobody listened. There was a choice. It was build the bombs and use them. Or risk the United States and the Soviet Union and the rest of us would find some way to go on living. Man (incredulous): Ha! That’s wishful thinking if ever I heard it. Julian: I’m not against wishful thinking. Not now. Man: Look, they pushed us too far. They didn’t think we’d fight no matter what we did. Julian: And they were wrong. We fought. We expunged them! We didn’t do such a bad job on ourselves. With the interesting result that the background level of radiation in this very room is nine times what it was a year ago. [turning to address the entire party] Don’t you know that. NINE times. We’re all doomed you know. The whole silly, drunken, pathetic lot of us. Doomed by the air we’re about to breathe. We haven’t got a chance. 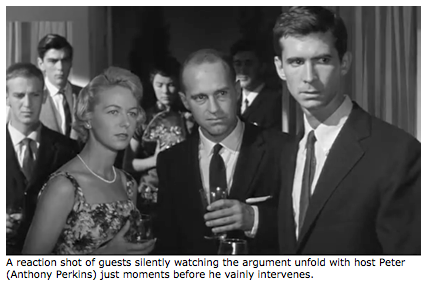 The film’s second narrative explanation for the war is also delivered by Julian, but unlike his earlier drunken, cynical rant, his later comments revolve around the notion of a spasm or push-button nuclear war. It was a popular trope used in the late-1950s and 1960s to signify the undue speed that modern life was embracing, where most things could be done ‘at the push of a button’. The war started when people accepted the idiotic principle that peace could be maintained by arranging to defend themselves with weapons they couldn’t possibly use, without committing suicide. Everybody had an atomic bomb and counter-bombs and counter-counter bombs…the devices outgrew us, we couldn’t control them – I know – I helped build them – God help me. Somewhere – some poor bloke probably looked into a radar screen and thought he saw something – knew that if he hesitated one thousandth of a second, his own country would be wiped off the map, so – so he pushed a button – and – and the world went – crazy…and ..and … (Julian exits here without finishing his sentence). Hence, the film gestures towards unchecked proliferation and an arms race based on counter-measures. It also provides the rationalisation that the computerised, push-button age is deeply implicated. But while Julian’s guilt-ridden soliloquy abrogates blame to mechanised systems beyond human control, the subtext clearly points to human removal from the command and control system, whereby a single frightened individual mistakenly and misguidedly ‘presses the button’, unleashing Armageddon. How close this scenario was to reality in late 1959 has only recently been confirmed in declassified US military files concerning the policy of immediate Launch on Warning. Shute’s novel projected its nuclear war four years into the future – written in 1957 and set in 1961. Kramer’s film was released in late 1959 but set in 1964. At the time of On the Beach’s release the US military Joint Chiefs completed SIOP-62, a Top Secret war plan which called for the launch of more than 3,000 nuclear weapons, including hundreds of hydrogen bombs, to attack – all within a few hours – approximately 1,000 targets in the Soviet bloc. Eisenhower had previously concluded, when facing “appalling” casualty estimates from differing models of thermonuclear attacks where the USA – regardless of warning and preparedness – would still suffer up to 65 per cent population losses, that thermonuclear weapons made war “preposterous”. After carefully studying the projected nuclear war scenarios, the President noted in his personal diary that, “it would literally be a business of digging ourselves out of the ashes, starting again”. Irrespective of these grim, secret nuclear war plans and the mutually genocidal outcomes for both antagonists and non-combatants, the US Government continued to advocate for civil defense (nation-wide alerts, public drills and shelter programs) and discounted fears over fallout. This makes the campaign waged by the Eisenhower Administration against the domestic and international release of On the Beach even more duplicitous. It was calculated, systematic and conducted at the highest levels of government. Although the Cabinet discussion has been noted briefly by historians such as Paul Boyer (1985) and Allan M. Winkler (1999) it has not yet received the sustained analysis it deserves given the Presidential precedent the debate created. Three weeks prior to the film’s discussion at Cabinet level, the Secretary of State was briefed by his Special Assistant, William W. Scranton. 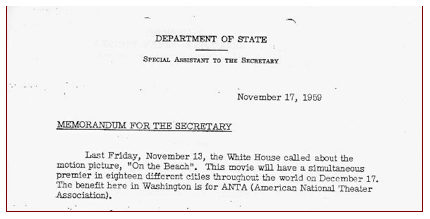 The Administration was worried about a Washington DC fund-raising event organised by Mrs Robert Low Bacon, screening On the Beach to benefit the American National Theatre Association (ANAT). Scranton advised his superior, “despite the excellent beneficiary of this occasion, the White House is very concerned […] because of the movie and its implications for civil defense, etc.” Mrs Bacon had requested Cabinet backing but “naturally the White House turned this down”. Unperturbed, Bacon made overtures to Mrs Eisenhower but, as Scranton understood it, the offer was to be “rejected diplomatically”. Mrs Bacon’s determination to elicit support continued with her seeking the endorsement of “the Ambassadors from foreign nations” but the Special Assistant advised the Secretary that the “White House has requested our help to scotch this”. Further, Scranton recommended that the film be discussed at the next “large staff meeting”, concluding with a request that “bureau heads to do everything diplomatically possible to discourage Ambassadorial support”. 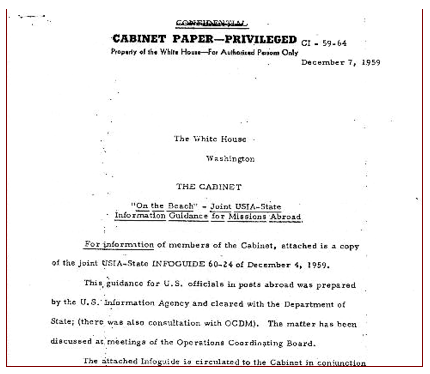 This internal State Department memorandum partially contradicts the joint United States Information Agency (USIA) – State Department “infoguide” to On the Beach – drafted in consultation with the Office of Civil Defense Management (OCDM) – that was presented to Cabinet at the 11th December meeting, as part of a package of materials for consideration and circulated in advance to respond to the film. The USIA-State infoguide preamble states “little can be done to affect the film’s impact on foreign audiences”. Yet the just cited State Department memo’s sotto voce diplomatic approach “in private” was precisely aimed at limiting the effect of the film internationally. It is difficult to perceive how cooperation in this production could in any way enhance the U.S. Naval Service of the Department of Defence […] Any service cooperation on such a movie would only serve to dignify the story and add an official blessing to the possibility of such an impending disaster. At this time this film with its utterly pessimistic outlook and message does not deserve any cooperation with its production… [the] entire theme is negative to say the least, and frankly there appears to be a tendency to ‘blame America’ in much of its presentation. The USIA added that it did not want to be associated with the movie “in any way”, concluding that the film “could not conceivably advance the interests of the United States”. Ultimately it took considerable personal coaxing from the US Navy Chief of Operations, Admiral Arleigh Burke to convince his own staff, and the USIA, of the merits he foresaw in using the film to promote the US ‘philosophy’ and policy of mutual deterrence where the need to use any weapon could be viewed as a legitimate instrument of national defense. Burke met with Kramer and they came to an agreement in order to secure the Navy’s cooperation. According to an official record of the meeting Kramer gave assurances to introduce “such changes that were mutually agreed on by the Navy and himself to remove the pessimistic slant of the novel on ‘utter annihilation’ which might be unfavourably interpreted”. Unlike the other national agencies and the federal Executive, Admiral Burke felt it best to work with the producers and exert some policy influence, rather than deny help and have no say in, or to try to sabotage, the outcome. Handled correctly he felt On The Beach could aid the national interest. It was a view that found little, if any, support either within the Pentagon or amongst the broader political and government apparatus. The USIA continued to undermine this approach while the Pentagon acquiesced slowly and begrudgingly on official cooperation. By the time of the film’s release, the USIA was instrumental – under State Department direction – in waging a ‘softly, softly’ campaign to subvert the movie’s credibility and popularity with domestic and overseas audiences. Further tabled at the US Cabinet meeting were briefing documents authored by USIA in consultation with the Office of Civil Defense Management, prior to their dispersal to major international missions and consulates targeting the capital cities where Kramer’s premiere was planned for simultaneous international release. USIA was so concerned by the film’s potential impact that the agency instructed all relevant US diplomatic posts to report all press and public reaction promptly by wire. Having previously rejected Admiral Burke’s concept of using Naval cooperation to extract some leverage in the script to advance the national interest, the USIA and State Department nevertheless saw some “limited potential” in the completed film, suggesting: “it may offer opportunities to turn this emotional response into intellectual support of our quest for safeguarded disarmament”. 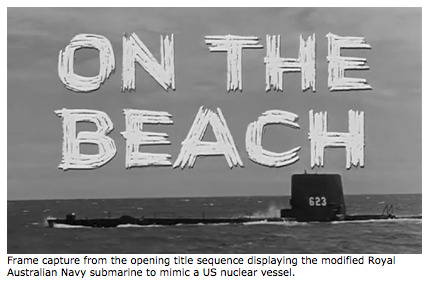 The document lists a three-point strategy in order to spin the Administration’s foreign and domestic nuclear policy against the film, employing diplomatic critique that is “constructive […] without implying approval […] in private discussions with government officials or opinion leaders.” Firstly, the authors suggest that although On the Beach is a scientific fiction, the “strong emotional experience” of the film should be channelled “for thinking people” towards the “vital importance of achieving safeguarded disarmament”. Regardless, the revised emphasis should be on “general” disarmament as “indivisible”, covering “both nuclear and conventional arms”, since “to reduce nuclear arms alone would be to remove the free world’s counter-weight against Superior Soviet-bloc conventional forces”, and that “with patience and persistence, real progress is attainable”. War itself is the real evil, not any particular weapon. Conventional weapons kill just as effectively as nuclear weapons; morally there is no distinction. This point conveniently ignores and evades the specific non-conventional aspect of nuclear weapons – the long-lived fallout, radiological warfare and its invisible, creeping death that is at the heart of both the film and novel. Secondly, the document proposes that the “scientific inaccuracies of the film” will mislead audiences and drive them “to pressure for ban-the-bomb-type solutions”. Noting the “two basic flaws” in the film’s scientific treatment of fallout would help to quell that momentum, the USIA-State Department asserted. 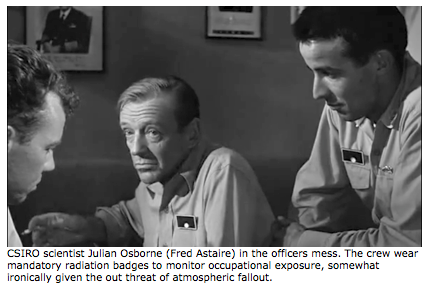 These arguments, however, deliberately ignore the futuristic premise of the film (and book) – that specially designed, dirty cobalt bombs are used for radiological warfare – when it asserts that “no one in the southern hemisphere would be killed, or probably even made sick, by a nuclear war as far away as the northern hemisphere”. Again, in contradiction to known war-planning evidence at the time, it emphasises that the: “Effect of fallout radiation from a nuclear conflict would be confined to countries directly attacked or those close by”. More surprisingly, the briefing guide leaves open the technical possibility of Armageddon: “unless active hostilities were to spread to every part of the globe, a nuclear conflict would not mean the ‘end of the world’”. Thirdly, the Infoguide argues “the film grossly misconstrues the basic nature of man. The resort to mass suicide is not only unnecessary but wholly fatalistic.” Superficially, this assertion may seem reasonable, but what is really being misconstrued is the premise of the film (and book) and evasion of historical precedent. The scenario is about inevitable and inexorable death in the form of lethal cobalt fallout. The stoic tropes of ‘fatalism’ and ‘mass suicide’ are provocative and dramatic expressions of such a fictional treatment. 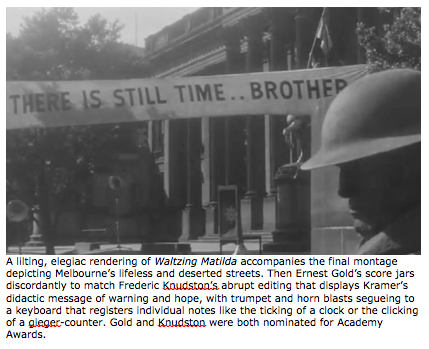 Nor does the document refer to the deliberately upbeat conclusion of the film (as opposed to the novel) via the didactic image and strident musical score hammering home its message to the audience – the Salvation Army banner, blowing in the radioactive wind, “There is still time…Brother”. In Stanley Kramer’s didactic fashion, this semiotic ‘message’ may also have been inserted as a concession to the Pentagon in order to gain limited military cooperation and in line with the US Navy’s suggested script revisions. It is inconceivable that even in the event of a nuclear war, mankind would not have the strength and ingenuity to take all possible steps toward self-preservation. Yet it is precisely conceivable, which made it the grist of author Shute and scriptwriters Bill Paxton and James Lee Barrett, as literary and cinematic fictions that captured the imagination of audiences worldwide in the tens of millions. It was the emotional resonance of Shute and Kramer’s terminal drama and its depiction of survivors wrestling with their immutable fate, having scientifically discounted any possibility of future life, that elicited strong empathy and drew such a large international readership and commercial success. we recommend that comment be refused on the picture. However, we can hardly refuse comment on the question of whether or not the situation portrayed in the picture without reference to the picture has scientific validity. The world-wide strontium-90 fallout resulting from the assumed attack would not pose a major survival problem in countries not attacked […] The worldwide fallout hazard […] would not be very important in terms of survival of the countries not attacked or not in the downwind fallout patterns. As indicated earlier, the Pentagon’s own war planning evidence contradicted this claim, describing heavy casualties from fallout as collateral damage on neighbouring (non-belligerent) countries. Hence, this AEC invocation of the Congressional report is a fraudulent argument concerning On the Beach since it ignores the premise of thousands of Cobalt-laced weapons used for radiological warfare. Strontium-90 is only one of many hundreds of radioactive by-products of fission and fission-fusion weapons, many of which are long-lived, created in each nuclear explosion. Using Strontium as the benchmark by which to judge the futuristic scenario of the film (and book) is deliberately deceptive. Underplaying radiological impacts was a smoke screen repeatedly used by successive US Administrations to disguise the effects of fallout and the myriad of radioactive particles produced with each atmospheric detonation, and subsequent underground tests. It echoes Eisenhower’s own policy directive to his Administration on matters nuclear, to keep the public “confused over fission and fusion”, to create uncertainty and wedge a divide between experts and laymen. Nevertheless, the Congressional Special Subcommittee that oversaw the study recognised that in this major, but limited war “it was estimated 30 percent of the U.S. population would be killed”, where three-quarters of these fatalities would come from the effects of “blast, burn and immediate radiation damage” [my emphasis] rather than the longer-lived fallout presented in the book and film. The Q&A document foregrounds the Subcommittee’s finding that “civil defence preparedness could reduce the casualties of the assumed attack on the United States from approximately 30 percent of the population to 3 percent.” Again, this scenario is irrelevant to the premise of On the Beach with its long-lived Cobalt fallout. To avoid death in this scenario would necessitate many years of hermetic sheltering and decades of decontamination – resulting in certain irradiation and/or starvation regardless of geographic location. More importantly, an all-out war involving thousands of weapons (as opposed to the hundreds envisaged in the Subcommittee’s modelling) was understood in the late 1950s to mean virtual annihilation. Writing at the time of On the Beach’s release physicist Ralph E. Lapp, former Assistant Director of the AEC’s Argonne Laboratory and Head of Nuclear Physics at the Office of Naval Research, considered larger scale attack scenarios, which recent cold war document declassifications have confirmed as consistent with Pentagon war planning. Lapp found that “Fallout presents the possibility of a veritable ‘saturation’ attack, meaning that it could envelope the entire nation in lethality” (172), where 10,000 megaton attack would mean 80 percent of the unsheltered US population would die within two months, or 95 percent if the attack released 20,000 megatons. The figures for the Soviet Union, despite its larger geographical dimension, were essentially the same. Lapp concluded unequivocally that “Present stockpiles are more than adequate to spread radioactive lethality over an entire continental land mass. This is part of the new dimension of nuclear war.” (173) According to the authoritative Bulletin of Atomic Scientists, at the time of Stanley Kramer’s film adaptation of On the Beach, filmed in 1959 but set in 1964, the global nuclear arsenal reached approximately 31,000 weapons with most in the megaton or multi-megaton range. 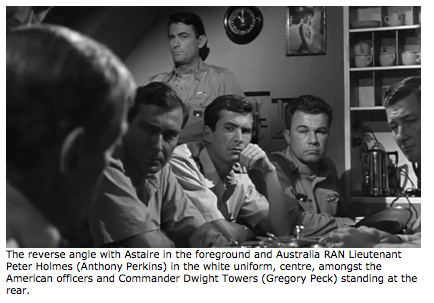 The AEC response sheets to the film, therefore, directly contradicts and downplays top secret advice given by its own senior military advisors to government. These responses were to war plans based on then-existing weapons stockpiles and (inflated) CIA estimates of Soviet capacity, not the futuristic scenario of On The Beach with its projections of increasing nuclear proliferation and a scenario of dirty radiological attacks using cobalt-hydrogen weapons. on whether destruction to mankind could occur in the manner portrayed by the movie On the Beach – through a nuclear war which destroyed life in the Northern hemisphere at once and generated radiation which after a lapse of some months spread to the Southern Hemisphere. The three-page reply mostly reiterates the Q&A material found in the first document, emphasising again that the film “is one of science fiction and not science fact [and] contains serious scientific errors”. The response further discounts the “dramatic” and “hypothetical situation” of the film as “unrealistic because it is based on incorrect assumptions”. It too cites the 1959 Congressional Subcommittee, asserting that although people “some hundreds of miles downwind from a very large nuclear detonation would be in danger from the fallout radiation, there would be many survivors even in a country subjected to nuclear attack.” Further, the text dismisses as “incredible” and “fantastic” the idea of “the destruction of all human life”, which it claimed would require the detonation of hundreds of thousands of megatons dispersed around the world. Yet this official response deliberately evades answering the question posed, namely “the destruction to mankind […] in the manner portrayed by the movie”, i.e. the fictional, though technically feasible, use of dirty thermonuclear weapons with long radiological half-lives. to understand that ‘unprecedented destruction’ is not the same as ‘unlimited destruction’. In sum, each of these documents sought to publicly defend and deflect criticism from the Eisenhower Administration’s policies concerning nuclear testing, disarmament and civil defense while subtly directing diplomatic efforts to discourage engagement during the global release of On the Beach by (falsely) disputing its scientific bone fides. 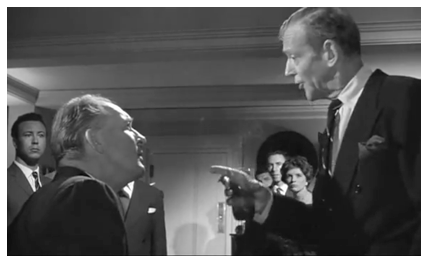 An elaborate and orchestrated campaign by the Eisenhower Administration to undermine the cultural and political impact of Stanley Kramer’s film adaptation of On the Beach seems irrefutable. There are few other documented examples, if any, of US Cabinet level deliberations detailing White House directed interventions in an attempt to mould the public reception of a Hollywood film. However, this article suggests the potential scope for work to be undertaken to investigate not only the ongoing support of cultural production to advance the soft power agenda of US government agencies and various American administrations, but also confidential (if not clandestine) attempts to sabotage the reception of particular cultural artefacts and limit their influence when these works were deemed by US policy-makers at the highest level to threaten the national interest. Joel Kovel, Against the State of Nuclear Terror (London: Pan, 1983). My thanks to UCLA for enabling access to the Kramer deposit as an inaugural Ahmanson visiting short-term fellow in 1999. See “The Nuclear Vault” at the National Security Archive, George Washington University http://www.gwu.edu/~nsarchiv/nukevault/index.htm. See for example Barrett, Herrera & Baumann: Hollywood and the CIA: Cinema, Defense and Subversion (2011), Boggs & Pollard: The Hollywood War Machine: U.S. Militarism and Popular Culture (2006), Cull, The Cold War and the United States Information Agency: American Propaganda and Public Diplomacy, 1945-1989 (2009), Doherty: Projections of War: Hollywood, American Culture, and World War II (1999), Hixson: Parting the Curtain: Propaganda, Culture, and the Cold War, 1945-1961 (1997), Jenkins: The CIA in Hollywood: How the Agency Shapes Film and Television (2012), Koppes, Hollywood Goes to War: How Politics, Profits and Propaganda Shaped World War II Movies (1990), Robb: Operation Hollywood: How the Pentagon Shapes and Censors the Movies (2004), Saunders: The Cultural Cold War: The CIA and the World of Arts and Letters (2001), Sbardellati: J. Edgar Hoover Goes to the Movies: The FBI and the Origins of Hollywood’s Cold War (2012). See Suid, (1996 and 2002), Robb (2004). DoD/On the Beach, Box: 25 Folder: 6, Georgetown University, Special Collections. Kramer (160) & Spotto (167-68, 211). Memo from Arnold Picker to Stanley Kramer 18 August, 1959 on “methods of selection of candidates for the Nobel Peace Prize” and memo from George Thomas Jr. to Stanley Kramer 31 August 1959, concerning a meeting with Nobel laureate Ralph Bunche and 30 of his associates at the United Nations to “help with the Peace Prize idea”. 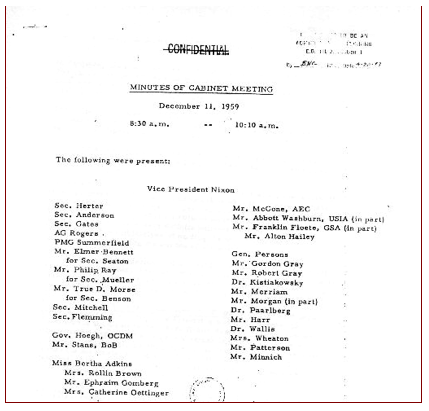 Minutes of Cabinet Meeting, 11 December, 1959. Eisenhower Presidential Library. Szilard and Arnold, quoted from The Bulletin of the Atomic Scientists, in John Renaker, Dr. Strangelove and the Hideous Epoch: Deterrence in the Nuclear Age (Claremont CA: Regina Books, 2000) 65-66. See, for example, “Cobalt Bomb is Frightening”, The Argus, 7 September 1953; “People Must Know of Bomb Says Professor”, Daily Mirror, 7 September 1953; “No Plan for Cobalt Bomb at Woomera”, Daily Telegraph, 8 September 1953; “‘No Danger in Woomera Tests’–P.M.”, Daily Telegraph, 9 September 1953; “Explanation on Bomb Needed, Declares Evatt”, The Sun, 8 September 1953; “Menzies Says No Risk To Life In Atomic Tests”, Sydney Morning Herald, 8 September 1953. The Sun, 7 September 1953. Shute’s handwritten calculations, while drafting his manuscript in the mid-1950s, detail the nature of Cobalt bomb radiation and the rationale for using the weapons. Nevil Shute (Norway) manuscript, “On the Beach”, National Library of Australia. ‘Hazard to Ourselves as Well as Our Enemy’: Overkill Problem Led Top Commanders to Complain About the SIOP’s Destructiveness”, National Security Briefing book, http://www.gwu.edu/~nsarchiv/NSAEBB/NSAEBB130/press.htm (accessed 20 January 2013). Eisenhower Diary, 23 January, 1956. Memo by William W. Scranton, Special Assistant to the Secretary of State, 17 November, 1959. Eisenhower Presidential Library. Myer P. Beck memo to Stanley Kramer, 21 August 1958. Stanley Kramer Collection, UCLA. Correspondence from Navy Office of information, 9 June 1958, DoD/On the Beach, Georgetown University Special Collections. Correspondence from Director, Motion Picture Service, USIA, 24 June 1958, DoD/On the Beach, Georgetown University Special Collections. “Memo for the record”, 27 August 1958, cited in Suid (1996, 287). At the time of preparing the Infoguide, Kramer had just announced his coup of securing a screening in Moscow simultaneous with the other international capitals. 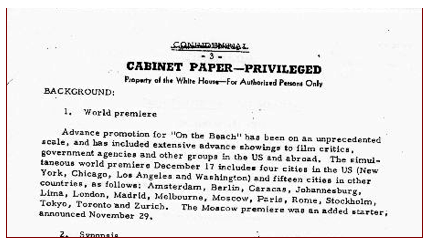 It is somewhat ironic that the document cites as an example of “progress” the Geneva Test Ban negotiations given the significant US opposition and reluctance to join the earlier Soviet moratorium on atmospheric detonations. See Adlai Stevenson, “Foreword”, in John M. Fowler (Ed.) Survival: a Study of Superbombs, Strontium 90 and Fallout. London: MacGibbon & Kee. pp x. “Suspension of testing of superbombs, which may have sounded daring or Utopian when I urged it in the 1956 campaign, became an historic fact in 1958 […] an agreement among the nuclear nations to ban bomb tests above ground has become not only entirely practicable but almost inevitable […] The further step of banning nuclear bomb testing altogether, by prohibiting testing underground, has become a matter of technical ways and means […] Delay is dangerous. We cannot afford to let negotiations drag”. It didn’t happen until nearly 40 years later with the Comprehensive Test Ban Treaty. On the strong moral and ethical considerations of thermonuclear war, see Richard Rhodes Dark Sun. See Lester Matchta and Robert J. List. “The Global pattern of Fallout” in John M. Fowler (Ed.) Survival: a Study of Superbombs, Strontium 90 and Fallout. London: MacGibbon & Kee, pp 28-36. The mass suicide of Jews at Masada in antiquity is once such example. More recent examples have been the Jonestown ‘cool aid’ mass suicide and the Heaven’s Gate cult. 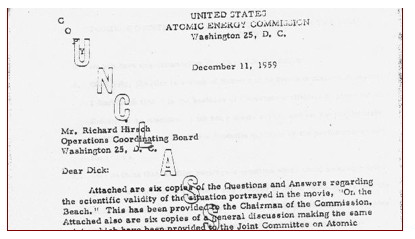 Correspondence from Morse Salisbury, Atomic Energy Commission, 11 December, 1959. Eisenhower Library. John M. Fowler. “The Rising Level of Fallout”, in John M. Fowler (Ed.) Survival: a Study of Superbombs, Strontium 90 and Fallout (London: MacGibbon & Kee, 1960), 51-67. Lapp, (172): 75% killed in the USSR after a 10,000 megaton attack, 90% after a 20,000. “General discussion paper” attached to correspondence from Morse Salisbury, Director, Division of Information Services, Atomic Energy Commission, Washington DC. 11 December, 1959. Eisenhower Presidential Library. See Mick Broderick “The Buck Stops Here: Hiroshima Revisionism in the Truman Years” in Jacobs (ed) Filling the Hole in the Nuclear Future: Art and Popular Culture Respond to the Bomb (Lanham MD: Lexington, 2010), 135-158.